The Earth may orbit around a single star, but most stars like oursun are binaries ? two stars orbiting each other as a pair. In fact there aremany three-star triple systems, even going up perhaps as high as seven-star ?or septuplet ? systems. Although astronomers once thought these systems might not easilysupport planets, worlds with multiplesunsets might actually prove common. And now, powerful telescopes are beginning to resolve thesesystems to reveal how they work. Our sun is a so-called class G star, but it is oddly solitary whencompared to other stars in the same class. "One-third are single, while two-thirds are multiples,"explained astronomer Charles Lada at the Harvard-Smithsonian Center forAstrophysics in Cambridge, Mass. Still, while most systems with stars like oursun are multiple, most systems in the universe are not, Lada explained.Class G stars only make up roughly 7 percent of all stars we see. When it comesto systems in general, "about 70 percent in our galaxy are single, whilethe rest are multiple," he said. The overwhelming majority of stars in our galaxy are class Mstars, ones roughly one-tenth to one-half our sun's mass. "If there are400 billion stars in the Milky Way galaxy, then about 325 billion of those areM stars," Lada said. "They have a very low binary or multiplefrequency ? maybe only about 15 to 25 percent of such systems." For many years, scientists thought most stars were multiples. "It'sonly in the last 15 years or so that we've been able to identify and studythese low-mass stars, which are very faint," Lada said. On theother hand, when it comes to massive stars, "say four to 10 times the massof our sun, they're almost always in multiples," Lada said. Ofcourse, while most systems only have one star, since binary and multiplesystems do after all have more than one star, "you can say that roughly halfof all stars are in binary or multiple systems," Lada clarified. Thesereason high-mass stars are often in multiples while low-mass ones are not mightbe due to differences in how they form. "Low-massstars tend to form in very dense, cold, dark clouds," Lada said. "They are born when gravity wins out, causing these 'cores' to contractfurther, usually forming single systems. On the other hand, massive cores tendto be turbulent, with gas within generally moving at higher velocities. Thoseare very susceptible to fragmentation, and so can form multiple stars orbinaries." Curiously,the nearby Taurus-Auriga star-forming region "does have a very highfraction of binary stars, even for G stars, and maybe even extending to Mstars," Lada said. "Because of this, there's the thought that maybemost stars form as multiples, but these systems are then broken apart. "However, he noted that all calculations attempting to simulate this happeninghave not born fruit so far. Althoughworlds with fantastic multiple sunsets might seem the province of sci-fi flickslike "Star Wars" and "Avatar," alien worlds orbiting binarystar systems are science fact. In fact, "Avatar" is set on analien moon around a fictional planet orbiting the real binary star systemAlpha Centauri. Forinstance, scientists have detected a planet estimated at 1.76 times as massive as Jupiter orbiting theprimary star of the Gamma Cephei binarysystem roughly 45 light years away. When the stars in binary systemsare close together, planets have been spotted in orbits that take them aroundboth ? such is the case with PSR B1620-26 b, which orbits a pulsar and whitedwarf located roughly 12,400 light-years away and is the oldest known alienplanet at roughly 12.7 billion years old. Manyunanswered questions remain about how planets are born and develop in binaryand multiple systems. Now scientists are imaging the disks of gas and dustaround these systems that might eventually give rise to planets. 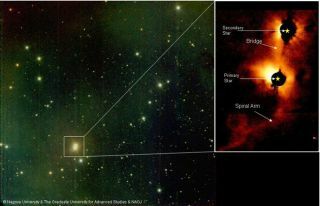 Scientistsin Japan captured the first direct images of a young binary system using theSubaru Telescope. The system, SR24, is located in the constellation Ophiuchus,520 light years away. Ina binary system, two stars orbit around a common center of mass. The brighteror more massive star is referred to as the primary star and the fainter or lessmassive one is called the secondary star. The circumprimary disk encircles theprimary, while the circumsecondary disk rings the secondary, and a thirdcircumbinary disk may surround both. Theresearchers in Japan were first to capture high-resolution, near-infraredimages of both circumprimary and circumsecondary disks around a young stellarobject. They also saw bridges extending from one disk to another, whichsupercomputer simulations suggest emerged from the collision of gas rotatingaround the stars. A long spiral arm of gas and dust was also seen extending outfrom the circumprimary disk, likely to the circumbinary one, which might befeeding the circumprimary disk matter and fuel its growth. "Insuch widely spaced binaries, you could have planets around the two," Ladasaid.